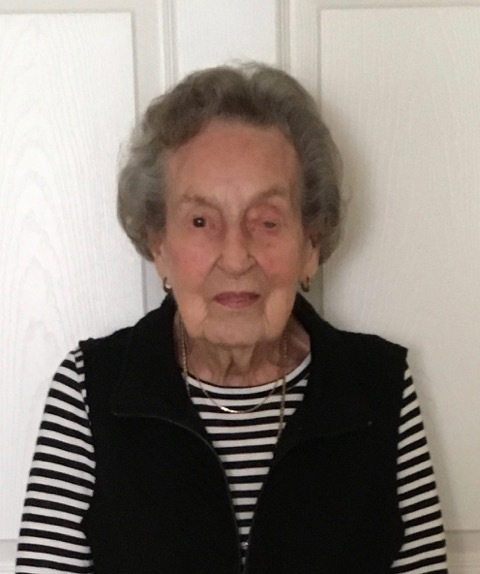 Eleanor Abigail Abernethy Durvin died on March 24, 2019, at 101 years old. Until a month before she contracted bronchitis and flu in late February, she was getting around well with her walker, doing a daily set of exercises, listening each week to “Wait, Wait Don’t Tell Me” on WUNC radio, and reading books and news magazines. She was born January 6, 1918, in Cumberland, MD, the third of five children, to Sutton Odessa and Otis E. Abernethy. She was the last surviving sibling. Eleanor grew up in various towns in West Virginia and finished high school in Charleston, WV, where her family had settled before her senior year. After high school, Eleanor attended a business college. In 1939 she moved to Slab Fork, WV, a coal mining town, to work in the dry goods department of the company store as a temporary replacement for her sister. When her sister returned to work, she stayed, working in the company offices. In Slab Fork she met Ben Durvin, the mining engineer for the Slab Fork Coal Company, and they married January 23, 1943. After her husband was drafted into the army, she moved from Slab Fork and alternated living in Charleston, WV, and Richmond, VA, her husband’s family home. While Ben was serving in the Army, she traveled to several cities where he was based, once even taking their 6–month old daughter, Melissa Noble, born in November, 1943, with her to Tulsa, OK. When her husband returned from the war, they resettled in Slab Fork and had two more children, Benjamin Franklin III (January, 1949) and Melinda Gail (February, 1950). Eleanor and Ben lived in Slab Fork for fourteen years, where she was active in the schools’ parent-teacher associations, the community church and the Gulf Women’s Club. She was a very supportive parent of all three children—attending performances and games, driving to activities, and encouraging their interests—and she created a comfortable home for her family. She valued ties to her siblings and to their families and her children grew up enjoying their cousins. In 1960 Eleanor and Ben moved their family to Richmond, VA, and she went to work for the Miller & Rhoads department store. Initially she worked as a sales clerk in women’s wear, advancing to assistant buyer for the designer dress department and completing her career as an assistant in the personnel department. When her husband Ben passed away suddenly in 1967, she provided the emotional support to hold the family together and the financial support to ensure that her younger two children could continue with college. She also took care of her mother-in-law, Myrtle Clements, until her death. In the early 1980’s Eleanor retired from Miller & Rhoads and moved to West Columbia, SC to live near her older sister, Margaret. While she lived there, they enjoyed traveling to different places in the U.S. and having her grandchildren visit. In 1992 she moved to Chapel Hill, NC to be closer to her daughter Melinda and her family. In retirement Eleanor continued to enjoy a full life: she made friends with neighbors, liked to cook and bake, and walked regularly to exercise. At the age of 84 she made her first trip to Europe to visit her daughter Melinda and her son-in-law Jim, who were living in Switzerland. Most of all she enjoyed spending time with her grandchildren: they visited her, played games with her, loved her cooking and baking and she even dog-sat for them. Until 2018 she continued to live independently in her small condo in Chapel Hill. A fall in April necessitated her moving later that year into assisted living at Brookdale Senior Living in Burlington, where she received compassionate care and assistance. At Brookdale she was a true listener for other residents and staff. Eleanor was a remarkable woman. She was independent. She met adversity head-on and was a realist. She could adjust to new situations as needed. She was smart, creative, and persistent. Her children feel fortunate to have had her as a mother and a model for living. Her children and grandchildren will miss her. Eleanor is survived by her three children and three grandchildren. Her older daughter, Melissa and her husband, David Trevvett, of Brookline, MA, are the parents of Philip Trevvett, who lives with his wife Cassie Tharinger, in Providence, RI. Her son, Ben, of Midlothian, VA, is the father of Rebecca Dawn Durvin Stauffer, who lives with her husband, Mark Stauffer, in Gaithersburg, MD, and is the widower of Barbara Fulp Durvin. Melinda and her husband, James Leonard, of Pittsboro, NC, are the parents of Sutton Leonard of Gibsonville, NC, and Patrick Leonard (deceased). Or to the UNC Hospice, where she received thoughtful, warm and expert care. Online at go.unc.edu/unchospice, or checks can be made payable to the Medical Foundation of NC and mailed to 123 West Franklin Street, Suite 510, Chapel Hill NC 27516.